Sometimes you can’t do it all in-house: you might not have enough staff members for an event or might need more trucks to deliver your gear. In these cases, you can mark a service as sub-contract. Sub-contracting is when you use a third-party supplier to fulfil a service on your behalf for a customer. If you work with a freelancer or external crew member that you trust, you might add them to your Current RMS system as an external resource. Your internal staff members and vehicles might also have costs associated with them, too. In Current RMS, you can log costs against your sub-contract services, as well as internal and external resources. When you add a service to an opportunity, mark a service as sub-contract, or allocate bookable resources to an opportunity, Current will automatically add a cost to your costs view. This lets you see exactly how much profit you’re making on a job. Where can you set costs for services and bookable resources? When you add a bookable resource to a service, set costs for that particular contact, user, vehicle, or venue performing this service. When creating or editing contacts, users, vehicles, or venues, set costs for that particular crew member, vehicle, or venue. These costs are used when the above cost isn’t found. On a service page, add a list of costs for sub-contract suppliers. These costs are used when a service is being sub-contracted. When creating or editing a service, set costs against the service. These costs are used when none of the above costs are found. Once you’ve created your service, choose which people, vehicles, and venues are available to fulfil it by adding bookable resources. To add a bookable resource, click Add a new resource under the “Resources” heading. You can specify costs for each rate type here. Already created bookable resources? Edit a bookable resource by hitting the blue arrow and choosing Edit from the menu. Pop in costs for each rate type here. 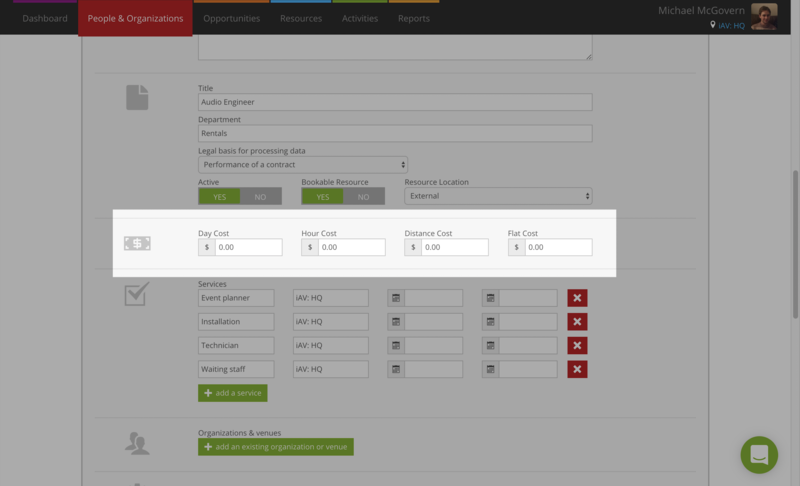 When creating or editing a contact, user, vehicle, or venue that’s a bookable resource, enter costs for each rate type. Remember to toggle the “Bookable Resource” slider to YES for the contact, user, vehicle, or venue to see the cost fields. You can add sub-contract costs for specific suppliers – great if you regularly sub-contract gear from the same local companies. Costs you enter here will be used when the supplier you set on a sub-contract booking on an opportunity matches a supplier in the list. From a service page, click add a new supplier cost at the bottom-right of the “Supplier Costs” heading. Sub-contract is listed here for your reference. Enter the cost for each of your rate types. Use the blue arrow to the right of a supplier cost to edit or delete it. 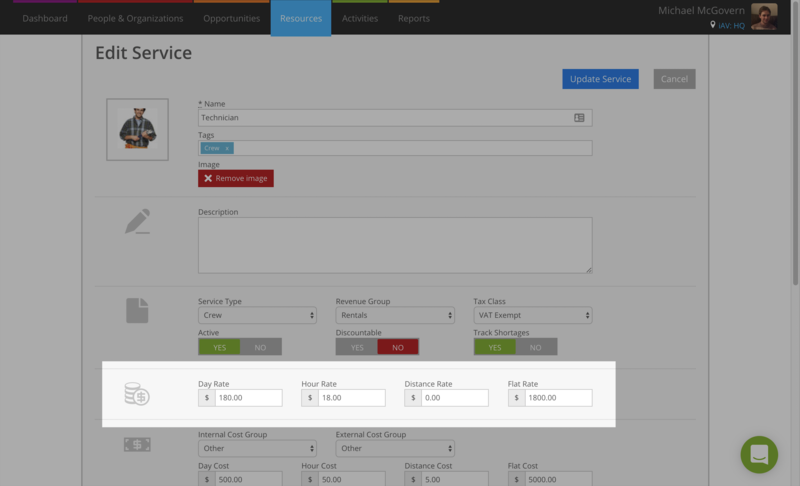 When creating or editing a service, set a cost for each rate type. The costs here are used when no bookable resource or sub-contract supplier cost is found that matches bookable resources or sub-contract suppliers on the opportunity.